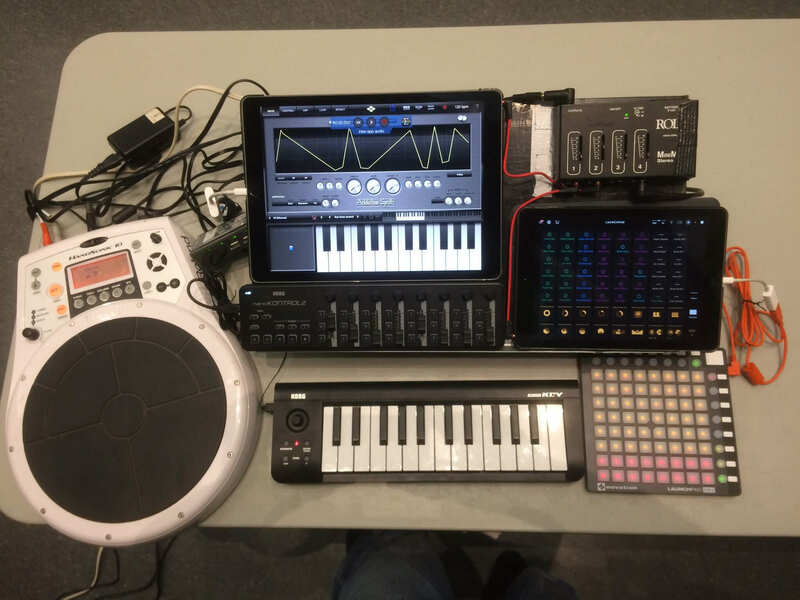 I've been using a LaunchKey 49 Mk2 for a few years in my live rig, but want to pare things down as I add other controllers such as a LaunchPad Mini and my Handsonic. For keys I tried using my Korg Microkey 25 (along with my Nanocontrol 2 controlling AUM), and while I actually don't mind its key action I really do need the use of a sustain pedal. And yeah, a few more keys would be nice. I thought go either 32 or 37-key with a similarly slim profile. I can find very few reviews on the M-Audio (note that this is the Mini version), but size-wise it's perfect. The iRig may end up being wider than I'd like, but feedback on either product would be greatly appreciated. Thanks! Teaser shot of my live rig. I have the M-Audio keystation mini 32 and would definitely recommend it as a simple, lightweight alternative with the bonus of having a few extra notes. It is very light and plasticy but has lasted just fine and is surprisingly nice to play (I don’t mind a slightly spongy synth action but you might feel differently). One thing I do miss is having a mod wheel or pitch bend, the Irig 37 does have one so if its essential for you I’d go with that. You do have plenty knobs with the nanokontrol so maybe it’s not a necessity. One thing to note is that the USB cable should stay in the keyboard or be removed with care when transporting, the soldering is said to be iffy so the connection can break off inside if you’re not careful... or so I’ve read.. who knows how some people handle their things? What about a CME X-key? A friend got an irig keys and we both agreed, they were the cheapest feeling keys we'd encountered on anything that wasn't a kid's toy. Not sure what happened, it is a reputable company. These small units are great for the right workflow, buy my god don't be as dumb as me and think it can sub in for all piano work that has a narrow/simple range. Just totally different requirements. I use them when possible but also need octave range without hitting buttons all the time. Casio's new digital piano costs $399/weighs 25lbs, and personally (YMMV) I have no problem using a digital piano as a midi controller. Since it does well in my workflows, at 25lbs I almost wouldn't mind carrying around 88keys on my back anywhere I need it (yes you can turn the weighting pretty far down if that bothers you).